During his 14 years as Laurier's vice-president of finance and administration, Jim Butler has taken the "long view." It's an approach that's left the university on a sound financial footing as Butler heads into retirement on Aug. 31. "It's bittersweet," Butler said of the upcoming milestone during a recent interview in his Regina Street office. "I'm leaving a lot of friends, people I've worked with and come to know and appreciate. "But I'm also looking forward to a new chapter in my life. I'm a person that's accustomed to change. One door closes and another one opens." Butler is credited with steering Laurier through challenging financial times, intense labour negotiations and pension plan reform, all while finding ways to build new infrastructure on the university's Waterloo and Brantford campuses. When he arrived at Laurier from the University of Windsor in 2002, Butler knew the way the university operated from a financial standpoint had to change. In fact, he admits he was a little worried. "Cash flow was all upside down," Butler recalled. "In the first summer, we were into our line of credit for about $24 million and we only had a limit of $25 million. So I had to work with the banks and make sure that everyone was okay with what was happening. "I had to do some financial re-engineering quickly just to manage the negative cash flows, which were very profound." That challenge led to Laurier in 2005 issuing $115 million worth of bonds under Butler's financial leadership. The bonds were snapped up by investors in less than half an hour. The move had a positive impact, creating stability in the university's cash flow. "We were one of the first universities to issue a bond," Butler said. "It led a lot of other universities to follow the same path. It also led to our first credit rating." Another key for Butler was making changes to the university's budgeting process, leading him to urge Laurier to carry out an Integrated Planning and Resource Management, or IPRM, exercise. This process engaged the university in a community-wide discussion to identify priorities and ensure they were appropriately resourced. "That is a major organizational change," Butler said. "I don't think people appreciate how significant an organizational change that is. And we're still living it now." Laurier's IPRM process gave birth to its adoption of the Responsibility Centre Management, or RCM, budgeting model, which more closely aligned financial decision-making with identified academic and administrative priorities. Helping grow Laurier has been key for Butler. He has also worked to implement a real estate and land-banking strategy that takes into account the university's needs over a 100-year horizon. That strategy has helped the university plan for growth of its Waterloo campus and transformed downtown Brantford. It has also proved to be a prudent investment that generates new revenue, which in turn supports the entire university. "Laurier has grown tremendously, one of the fastest-growing universities in the province," Butler said. "We've acquired a fair bit of real estate and real estate that is very profitable. That contributes to the operating budget." Butler has also taken great interest in Laurier's pension plan with a view to sustaining it over the long term. Noting that pensions are "a big deal for universities," Butler is continuing work to create a sector pension plan that would mitigate risk and see better return on investments. He is widely regarded as a provincial leader on university pension reform, co-leading the joint efforts of the province, universities and unions to make university pension plans more sustainable. The goal is a "multi-employer jointly funded pension plan." Laurier president and vice-chancellor Dr. Max Blouw said Butler has provided exceptional economic leadership and tireless service during his time at the university. Pamela Cant, Laurier's assistant vice-president: human resources, said Butler has made great contributions to both Laurier and the university sector as a whole. "One of his most significant contributions has been his leadership on a sector jointly sponsored pension plan," Cant said. "His strong knowledge of pensions coupled with his ability to build relationships and find common ground among groups with diverse interests has allowed the project to move forward in a very positive way." Tony Araujo, Laurier's assistant vice-president: campus administration and special constable service, credited Butler for his work to grow Laurier as a whole and its Brantford campus in particular, including the development of a new athletics centre in Brantford and the acquisition of Market Square in the city's downtown core. Araujo described Butler as a calm, quiet and thoughtful leader with a deep knowledge in many areas. "What I'll miss the most about working with him on a personal level is there isn't anything – whether it's bad news or surprising news – that causes Jim to get upset or worried," Araujo said. "In a senior leader – at an organization like a university especially – I find that to be a very unique quality." While leading change at Laurier, Butler has kept students and their academic experience top of mind, said Deborah MacLatchy, provost and vice-president: academic. 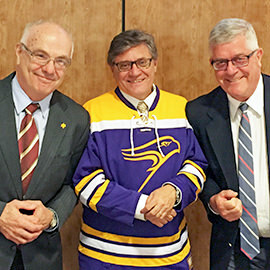 "Jim’s greatest contribution to Laurier was being a VP of finance and admin who really valued universities in general and Laurier’s mission in particular," MacLatchy said. "No technical abilities in a leader would outweigh that kind of whole-hearted commitment, especially his commitment to students and to the academic enterprise." Butler possesses a solid understanding of the academic side of universities, having taught at the University of Windsor and Western before arriving at Laurier. While his colleagues praise him for a job well done, Butler also offered praise to the many people he's worked with at Laurier over the years, as well as Laurier students, who he said make the university such a special place. "There would be no success without my colleagues and I've worked with tremendous people," Butler said. "Here, there's a can-do attitude, there's an attitude of beyond the selfish. "Some organizations are all in it for themselves, but at Laurier the students, the staff, the faculty want to do something that not just benefits them but benefits a greater good. I think the result of that is that we always punch higher than our weight." Butler has dedicated himself to serving the greater good, working with organizations outside of Laurier to the benefit of universities across the country. Those organizations include the Canadian Association of University Business Officers (CAUBO), for which he served as president, the Council of Ontario Universities (COU) and the Council of Senior Administrative Officers (CSAO), for which he served as chair. For his efforts, Butler was recently presented CAUBO's Distinguished Service Award and in 2011 was the recipient of the Ken Clements Distinguished Administrator Award. While his time at Laurier will soon be coming to an end, Butler intends to stay active when it comes to issues affecting Canadian universities. He will continue work on the pension file with the COU after his retirement, as well as work nationally assisting universities with collective bargaining through the Faculty Bargaining Service. He said he also plans to get involved in more charity work. "It's a semi-retirement," Butler said. "I'll still be involved in the sector both provincially and nationally. I'll do that for a few years. I think I'm going to be just as busy." After 14 years at Laurier, Butler said he's still as engaged in his position as the first day he started. Through each challenge and triumph during those years, he said staying focused on the long view was crucial. "Patience is key," Butler said. "We all have to live with each other on an ongoing basis, so it's long-term relationship building. Don't get too preoccupied with what's in front of you that seems to be a nagging, irritating issue. I've been around the block too many times – you have to take the long view." While he's seen and helped implement many changes at Laurier during the past 14 years, Butler said he's proud the university has remained true to its core values. "The changes have occurred in physical appearance, in the breadth of programming, how we've transformed Brantford," he said. "But what hasn't changed is the core values. What I'm pleased about is that we've managed to grow without changing who we are."